The mummy of the “tallest human giant who over lived” was being barked by a at the Atlantic exposition while., a number of these Smithsonian scientists were there. They asked permission to examine It and when consent was given applied their tapes and found that It measured eight feet four Inches from crown lo heel. The giant had been found In a cave near San Diego. Cal., by a party of prospectors, according lo the exhibitor. Over the head were though remains of a leather hood which appeared to have been part of a shroud. Worn teeth were visible j In the mouth and the outlines of the ribs were plainly seen through the skin. 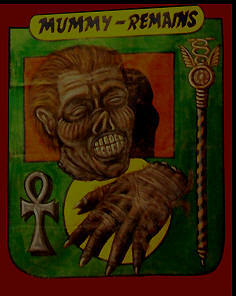 The elongated, emaciated body stood erect In a great, narrow coffin. ten feet long. The exhibitor agreed to sell it for $500 to the Smithsonian, which dispatched Mr. Lucas to ‘the scene. call, Prof. W. J. Mc’Oee, and others made a careful lost. A piece of the giant’s dried skin was removed and when tested In the chemical laboratory of the Smithsonian- – Ian was found to be gelatin. Professor McCee Is shown on the loft of the giant, was accompanying picture, and the exhibitor who was perfectly Innocent of the fraud, Is shown on Its right. 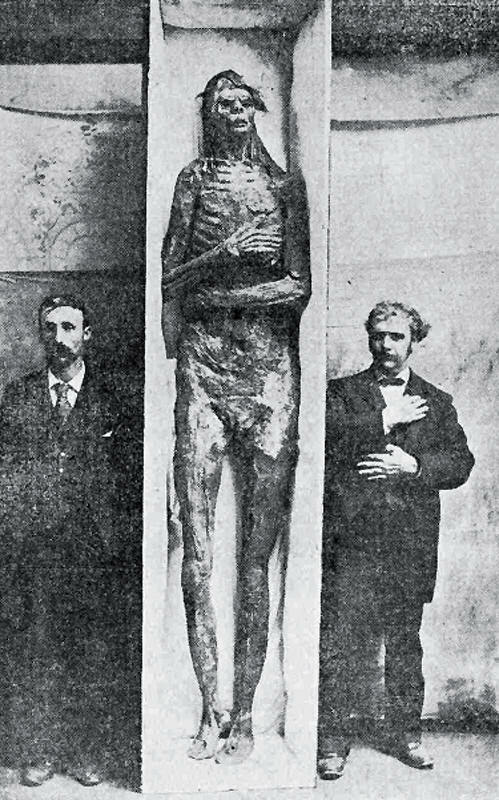 The “Cardiff Giant,” New York Statue was in commotion in the autumn or ‘C9 over the discovery of a petrified giant. 10 feet tall, upon the farm of one Newell, near Cardiff, Onondaga county. Newell stated that he uncovered the monster while digging a well. A tent was promptly placed over the pit and an admission fee charged. People swarmed about the scene and fought for admission to the lent, within which they saw lying 11 feet below the surface an enormous figure with massive features, its limbs contracted as if In agony. Its color indicated that it had laid long In the earth and over Its surface were miniature punctures, “like pores. The appearance of great age was further given by grooves on the under side, apparently worn by water, which trickled along the rock upon which the giant lay. where a German stone carver wrought the giant. Its pores being made with .1 leaden’ mallet faced with steel needles. After being stained with an aging preparation the giant was transported to a town In New York State, where Hull hauled It lo Newell’s farm at Cardiff by team. Newell sent his family on a trip covering the time of the giant’s arrival and burial. Hull, who was a religious skeptic, was undaunted by the exposure and felt that he had gotten even with the revivalist who preached the giant doctrine. Even after Ids confession, the Rev. Alexander McWhorter and Professor White, both of Yale, continued to believe in the giant’s antiquity, the former announcing that it was a Phoenician Idol upon which he had found an Important Inscription. Ono of those who from the first, branded the giant as a hoax was Andrew D. While, president of Cornell. 1) by selecting to believe the Smithsonian and the governments do NOT have our best interests. There is something that strikes me! That is the microcephalus comparison of the head in comparison to the great size of the body. It is what I always expect! Also! This head is obviously Neanderthal, . . . . How many Neanderthal skulls are this same size or larger but they are missing the 8 foot plus body. . . think about it!